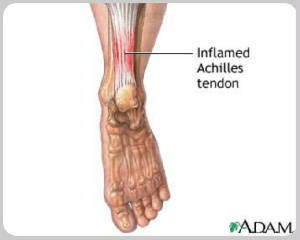 The Achilles tendon can grow weak and thin with age and lack of use. Then it becomes prone to injury or rupture. Certain illnesses (such as arthritis anddiabetes) and medications (such as corticosteroids and some antibiotics) can also increase the risk of rupture. You fall from a significant height. A sudden and severe pain may be felt at the back of the ankle or calf—often described as "being hit by a rock or shot." The pain may decrease quickly and smaller tendons may retain the ability to point the toes. Without the Achilles tendon, though, this would be very difficult. Both surgical and nonsurgical treatment will require an initial period of about 6 weeks of casting or special braces. The cast may be changed at 2- to 4-week intervals to slowly stretch the tendon back to its normal length. Casting may be combined with early movement (1-3 weeks) to improve overall strength and flexibility. A heel lift device and regular physical therapy follow for the remainder of treatment. Consultation with an orthopedic surgeon will determine the treatment and follow-up that is right for you.